SOUTHINGTON - The Southington boys lacrosse team has found itself in plenty of pressure-packed situations so far in the young season. Heading into Monday afternoon’s game against Newington, the Blue Knights had played two games, both being decided by one goal (one win, one loss). And once again, the game appeared to be ticketed for another tight finish, as the Indians erased multiple Southington leads to head to the fourth quarter tied. But Blue Knights head coach Ron Chase didn’t want any more thrills. He wanted to see his group pull away, and they responded. 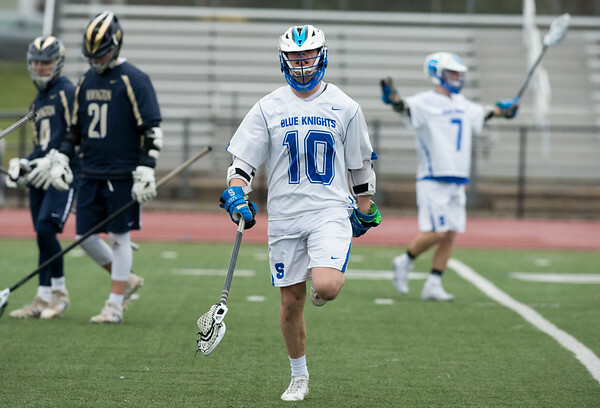 Nagle finds himself where a number of other Blue Knights are themselves, or have been before: an underclassman earning immediate varsity experience, which Chase believes provides the team with a valuable blend of youthful energy and veteran poise, which helps in tight games such as the first three contests of the season. Southington returned almost its entire varsity roster this year, and with the addition of a few impactful newcomers, the Blue Knights feel they have the formula to turn in a winning season after a disappointing finish in 2018. That senior group is highlighted by Evan Johanns, who fired in eight goals to lead a team that saw 11 of its 13 goals from its senior core that also includes Matt Thompson, who found the back of the net on Monday and scored three goals in the season opener. Southington has a little bit of everything this year, from a prolific 40-goal scorer like Johanns to a balanced spread of seniors and underclassmen that can provide a little bit of everything for a Blue Knights squad looking for a state tournament appearance. The youngsters now have a year of varsity experience to their credit, while the seniors pack plenty of talent and offensive firepower. Chase can likely do without more close games such as the first three for the sake of his nerves, but the Blue Knights have shown an ability to “close the door” in tight contests, which leaves the door open for a special season. Posted in New Britain Herald, Southington on Tuesday, 9 April 2019 18:25. Updated: Tuesday, 9 April 2019 18:27.